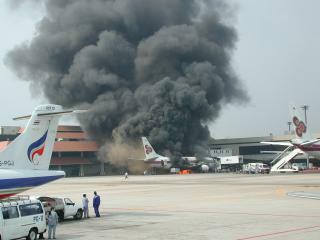 On 3 Mar 2001, a Thai 737-400 was destroyed by fire on the apron at Bangkok Airport. 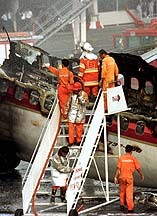 Only the crew were on board at the time, one of whom was killed in the incident. Early investigations were distracted by the fact that the country's Prime Minister was due to board the aircraft just 30mins after the explosion occurred. Naturally, early theories were of an assassination attempt, but investigators have since found evidence of an explosion in the empty centre fuel tank. 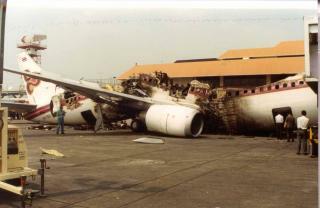 In 1990, 737-300 EI-BZG, operated by Philippine Airlines also suffered a centre fuel tank explosion. In 1996, the very high profile TWA 800, a 747-100 mid-air explosion which has been determined to have originated in an empty centre fuel tank. The common factor in all three accidents was that the aircraft had empty center fuel tanks. However even an empty tank has some unusable fuel which in the heat will evaporate and create an explosive mixture with the oxygen in the air. These incidents, have sparked (sic) debate about fuel tank inerting. This is universally considered to be the safest way forward. Boeing have risen to the challenge and have developed a Nitrogen Generation System to inert the 737NG centre fuel tank. Below is a compilation of news reports and official statements on this incident describing the event and how the investigation unfolded. BANGKOK - 03MAR2001 (AirlineBiz.Com) -- A Thai Airways Boeing 737 has exploded in Bangkok. The Boeing was being fueled at the time of the explosion, according to reports. The aircraft is a total loss (See Photos). always contains the most recent information on each accident. Flight TG 114 was parked at gate 62 at the domestic terminal of Bangkok Airport and was being prepared by 5 cabin crew members and 3 ground staff members for a flight to Chiang Mai. Thai Prime Minister Thaksin Shinawatra was one of the 149 passengers waiting to board the plane. At 14.48h, some 27 minutes before scheduled departure time, a fire erupted in the cabin, killing a flight attendant and injuring 6 others. The fire was put out in an hour, but by then the aircraft had been gutted by the fire. Authorities strongly suspect sabotage caused the explosion which destroyed a Thai Airways International plane only minutes before Prime Minister Thaksin Shinawatra was to board it yesterday. The Airports Authority of Thailand board concluded after a meeting that it may have been a bomb, given information it had so far, a source said. And if it was a bombing, the most likely target was the prime minister. A high-ranking aviation source said the ensuing blaze was also too hot and fierce to be a normal onboard fire. It had gutted the plane, which broke in half in just 40 minutes. This ruled out an accidental fire. Air force chief-of-staff ACM Kongsak Wanthana, who is heading the investigation, said all possibilities would be taken for consideration, including sabotage. The prime minister, his son Panthongthae, and other relatives, were among the 149 passengers who were due to board the Boeing 737-400 jet, which blew up on the boarding apron at Don Muang Airport about 2.40 pm. A steward, identified as Kampol Meelarp, was killed and seven other air crew and ground staff were injured. Two of them were admitted to Vibhavadi General Hospital and the others sent home after treatment. The crew were preparing flight TG 114 for a 3.15pm departure for Chiang Mai when explosions were heard from the front section of the plane, where Mr Thaksin was to have been seated in the business section, near the front of the aircraft, where the explosion and fire appeared to have been centred. Mr Kampol, the only fatality, was preparing the front section of the plane. Mr Thaksin was still on the expressway, en route to the airport, when the plane blew up. He, his son and some relatives were on their way to Chiang Mai, where he was to attend a meeting today. They were later taken to their destination in an air force plane which would bring them back today. Thai Airways president Pisit Kulsalasaiwanond said there was "a loud noise that sounded like an explosion" before the fire started. "We will investigate all factors. We do not rule out any possible cause, but we don't want to speculate," he said. All luggage had been loaded on the plane after being X-rayed, he said. An X-ray machine at the domestic terminal had been out of operation early yesterday, but it had been fixed before the luggage was loaded, he said. The plane had flown in from Phitsanulok and was to fly on to Chiang Mai. Chusak Bhachaiyudh, executive vice president technical, said if the engines had not started it was impossible for the explosion to be caused by an internal malfunction. Workers had finished refueling the plane shortly before the blast occurred. The fuel tanks, located in the plane's wings, were intact, he said, indicating that burning fuel was not the cause of the explosion. Thai Rak Thai party spokesman Suranan Vejjajiva said the prime minister's bodyguards, who were at the terminal, heard "a big bang" and saw the plane going up in flames. Other witnesses, however, said they heard two explosions in succession. Mr Thaksin said he was not worried about the incident, but his security personnel have curtailed his movements. He urged people not to jump to conclusions over the cause of the fire, but said special measures were being taken for his safety. "I hope it was an accident, but for now we will set up an investigation. Security has been increased and I cannot go anywhere I want," he said. Aviation authorities cut off power at the domestic terminal and diverted all incoming flights to an airport in nearby Chon Buri province before resuming normal operations three hours later. International flights were not affected. The plane was insured for 2.157 billion baht, Deputy Transport Minister Pracha Maleenond said. staff injured. No passengers had boarded the plane when the bomb went off. Chavalit said that investigations had shown the bomb "was certainly C-4," and he noted that only highly placed organizations or international terrorists would have access to the high-quality, military-grade plastic explosive. BBC - Investigators have yet to hand over their report. A bomb which gutted a Thai Airways jet that Prime Minister Thaksin Shinawatra was about to board contained a military grade plastic explosive, according to investigators. Defence Minister Chavalit Yongchaiyudh said "international terrorists" could have been behind the blast which killed one person. But he added that it was too early to say whether Mr Thaksin was the target. Investigators had established the blast was caused by a plastic explosive known as C-4 and was probably the work of highly trained experts. C-4 has almost no odour, is easy to mould and difficult to detect by X-ray. him," retired police General Prasarn Wongyai, an adviser to Thaksin told reporters. "Two days after the warning, it actually happened." BANGKOK, Thailand (AP) - Prime Minister Thaksin Shinawatra told Parliament Wednesday he did not think the bombing of a plane he was about to board was an assassination attempt against him. The Thai Airways Boeing 737-400 exploded Saturday on the tarmac at Bangkok airport, minutes before Thaksin and 148 other passengers were to board a flight for the northern city of Chiang Mai. One crew member was killed and seven other airline staff were injured. During a debate about the attack, Thaksin denied he was now using excessive security after the bombing - including traveling in an air force plane - saying he was only taking the advice of security officials. Earlier, Thaksin told reporters he suspected that the attack was perpetrated by "insiders" such as Thai Airways employees. Thaksin took power in January after his party won elections by an unprecedented margin. Thailand has a history of coups, but no prime minister has faced an assassination attempt. said was made with C4 plastic explosives - was a time bomb planted in the cargo area somewhere under seat rows 34 and 35 of the economy class. One crew member was killed and seven staff who were injured. BANGKOK (Reuters) - Thai Airways International offered a reward on Wednesday for information on the bombing of one of its airliners on March 3 just before Prime Minister Thaksin Shinawatra was about to board. The national carrier said in a statement it would pay $11,490 for information leading to the arrest of those believed responsible for planting plastic explosives on the Boeing 737-400. A Thai Air spokeswoman told Reuters the airline would start running advertisements of the reward in English and Thai-language newspapers from Thursday. Chief police investigator General Sant Sarutanond told a radio station on Wednesday his team thought the most likely explanation for the bombing was a rift between airline staff. BANGKOK, March 12 (Reuters) - Thai Transport Minister Wan Muhamad Nor Matha said on Monday an explosion and fire which wrecked a Thai Airways International jet this month was not caused by a bomb, as first thought. But a senior police officer who has been leading a probe into the blast said he remained convinced it was no accident. Thaksin initially said he believed the blast was an act of sabotage caused by C-4 explosives and that it was probably an assassination attempt. The Thai language Thai Rath newspaper on Monday quoted Thaksin and a senior military officer as saying a malfunctioning air-conditioning unit may have caused the incident. The explosion at Don Muang Airport earlier this month may have been caused by a malfunction in the airplane's air-conditioning system, Prime Minister Thaksin Shinawatra said yesterday. Mr Thaksin said police investigators were now working on two theories after Boeing officials found a fault in the air-conditioning system of the Thai Airways International Boeing 737-400, which blew up at the airport on March 3. Police earlier found traces of RDX, a component of C-4 explosive, at the scene of explosion and concluded that the blast was caused by a bomb. "It will take some time before a definite conclusion can be reached. "If the explosion was really caused by a malfunction of the aircraft, all airplanes of the same model will have to be recalled for corrections. "At present we cannot be specific about the cause," the prime minister said. The explosion occurred shortly before Mr Thaksin and his son were to board the aircraft. The blast killed a steward and injured seven other staff. Pol Gen Pornsak Durongkawibul, the national police chief, said his deputy, Pol Gen Sant Sarutanont, head of the police investigation team, inspected an aircraft of the same model on Saturday and met technical experts from the national airline. Pol Gen Pornsak said his office was now considering the new theory that the explosion was an accident rather than sabotage. Police were ready to consider this theory if it was supported by local and international experts. He said police would not feel embarrassed if the second theory was found to be correct, despite finding remnants of RDX and concluding it was a bomb. "In fact, if the conclusion is that it was not a bomb it would be good for the country and all concerned. We prayed from the beginning [that the blast was not caused by a bomb] but there was no clear proof," the police chief said. He said he would instruct Pol Gen Sant's team to look into this matter in detail. The US National Transportation Safety Board, which has been investigating an explosion and fire that earlier this month destroyed a Thai Airways Boeing 737-400 shortly before the country's prime minister was due to board, on Thursday said it had so far found "no evidence" of a bomb aboard the aircraft. The revelations shift the spotlight away from local conspiracy theories and on to the manufacturer, Boeing, and the wider industry issue of the role fuel tank explosions have played in recent aircraft accidents. In a briefing to Thai police supervising the probe, Robert L. Swaim, the lead NTSB investigator, said preliminary tests run by the Federal Bureau of Investigation on samples from the airplane wreckage had found no evidence of explosives, US officials said. Although the NTSB investigators are still in the evidence-collecting phase of their probe, Mr Swaim told Thai officials that the cockpit voice recorder and physical evidence indicated an explosion of the central wing fuel tank, US officials said. Under international aviation rules, the NTSB can participate in the investigation because it is the regulator that oversees Boeing, the aircraft manufacturer. Boeing officials have also been providing technical support to the probe. More samples from the wreckage are being sent to FBI laboratories for examination, officials said. The nine-year-old Thai Airways Boeing 737-400 was destroyed by a powerful explosion and raging fire on March 3 at Bangkok's international airport, shortly before Prime Minister Thaksin Shinawatra and 148 other passengers were due to board. A cabin crew member, one of five people on board the plane at the time, was killed. Within a day of the plane's destruction, Mr Thaksin said he believed the the plane had been destroyed by a bomb, which might have been an assassination attempt against him or another important person. Thai officials have since maintained that the plane was destroyed by a bomb, and said they suspected it could be due to internal conflict either at Thai Airways or in the Airports Authority. "This kind of vindicates Thai Airways," Jim Eckes, an independent aviation expert, said of the NTSB's initial finding. There have been a number of confirmed accidents involving the ignition of vapours in aircraft fuel tanks. The best-known case involved a TWA 747, which exploded shortly after take-off from New York in 1996 and crashed into the sea killing all 230 people. Last August, after the largest and most expensive transport investigation in history, the NTSB concluded that faulty wiring in a fuel tank had caused the explosion on the 25-year-old aircraft. Mr Swaim was also the lead investigator in that investigation. The NTSB immediately ordered an investigation into all airline accidents in the past 20 years to see if ageing aircraft were disproportionately involved. This followed findings that faulty wiring was commonplace in ageing aircraft. But age clearly was not a factor in the Thai Airways explosion - the 737 was nine years old, making it a relatively modern aircraft, which raises new questions about why the NTSB did not go further after the TWA enquiry. At the time, there were calls for the introduction of fuel-inerting systems - ground-based procedures designed to lower the volume of oxygen in tanks that could lead to an explosion - for all commercial jets. Explosive vapours are most dangerous while an aircraft idles before takeoff and during the first minutes after it becomes airborne. Once at cruising altitude, cold temperatures and thin oxygen reduce the likelihood of an explosion. Such inerting systems are in use with the major air forces around the world. The US safety regulator, the Federal Aviation Administration, and Boeing reported initial successes with such a system designed for commercial aircraft - where tanks are pumped with nitrogen to displace the flammable oxygen. According to the FAA, fuel vapours are at flammable levels for an average of about 30 per cent of an airliner's journey. Nitrogen inerting can reduce that level to 2 per cent. Authorities will send two parts from the Thai Airways International aircraft wrecked in last month's explosion at Don Muang airport for tests in the United States, to prove their sabotage theory. Thai investigators remain firm in their belief that the plane was bombed, although US experts said the blast was probably an accident since they had found no traces of RDX, a component of C-4 plastic explosives, as claimed by Thai investigators. "We must stick to our findings. We must prove to them by sending to the US the two parts on which we found RDX traces," said Chavalit Yongchaiyudh, deputy premier and defence minister, after yesterday's meeting with investigators handling the case. However, he seemed to be leaning towards the accident theory, saying that not a single scrap of a detonator or other bomb components had been found. "There must be these things if it was a terrorist bomb attack," he said. Also, 380 people had already been questioned but no clues were found that could add weight to the sabotage theory, Gen Chavalit said. The accident theory pointed to possible human errors while the aircraft was being refuelled before its scheduled flight to Chiang Mai in the afternoon of March 3. Prime Minister Thaksin Shinawatra and his son were also booked for the Chiang Mai-bound TG114 flight. The explosion occurred just minutes before they were to board the plane. Gen Chavalit quoted US experts as saying that the plane explosion might be similar to what had happened to a Philippine Airlines aircraft about a decade ago. The plane's central fuel tank was not filled up and fuel vapours that formed in the empty space inside the tank became ignited, causing the explosion. The National Transportation Safety Board is providing technical support to the Government of Thailand's investigation of a March 3, 2001 explosion and fire that destroyed a 9-year-old Thai Airways International Boeing 737-400 (HS-TDC) that was sitting at a gate at Don Muang International Airport, Bangkok, Thailand. A flight attendant aboard the plane was killed in the blast and subsequent fire, which destroyed the airplane. On March 22, 2001, Deputy Prime Minister Chavalit Yongchaiyudh related that the investigation is actively pursuing all potential causes for the loss of the airplane and that nothing has been ruled out at this time. Physical evidence has been found that the center wing tank exploded. The accident occurred at 2:48 p.m. on a day with temperatures in the high 90s Fahrenheit. The initial explosion of the center wing tank was followed 18 minutes later by an explosion in the right wing tank. Air conditioning packs, which are located directly beneath the center wing tank and generate heat when they are running, had been running continuously since the airplane's previous flight, including about 40 minutes on the ground. Although chemical traces of high energy explosives were initially believed to be present, samples have been submitted to the FBI for confirmation by laboratory equipment that is more sensitive than equipment available in Thailand. Although a final report has not yet been issued, the FBI has found no evidence of high explosives in any of the samples tested to date. Despite a thorough examination of the wreckage by Thai and American bomb experts, no physical evidence of a bomb has been found to date. The NTSB has a library of sound signatures recorded from previous flights and tests, including both fuel air explosions and high explosive charges. The recording of the HS-TDC explosion has features that are similar to recorded features of a Philippine Airlines 737-300 center wing fuel tank explosion in May 1990. Neither recording includes a precipitating sound of an initiating explosion that may have ignited the fuel tank. Many parts from HS-TDC, including fuel pumps and wiring, have been removed and are to be analyzed in laboratories. The Federal Aviation Administration is expected to order the nation's airlines to adopt new safety procedures that would further reduce the chances of a fuel-tank explosion on Boeing's 737, the world's most often-flown jetliner. An industry source said last night the federal agency will issue an emergency airworthiness directive, perhaps as soon as this week, as a result of the explosion last month of the center fuel tank of a Thai Airways 737 at the Bangkok airport. The directive would order airlines not to operate two fuel boost pumps in the center tank when the tank does not have fuel in it. Those pumps were running on the Thai jet even though the center tank was empty, the source said. The National Transportation Safety Board, in a statement yesterday, said there is no evidence the explosion of the center fuel tank was caused by a bomb or sabotage. The board also said the air conditioning units on the Thai jet had been running continuously for about 40 minutes while the jet sat on the ground at the Bangkok airport on a hot day. It is the third known incident since 1990 -- including the TWA Flight 800 catastrophe -- in which the center fuel tank of a Boeing plane blew up after air conditioning units ran for a long time while the planes sat on the ground on a hot day. Even though fuel tanks explosions are very rare, the safety board has been concerned for some time that a spark inside the center fuel tank could ignite fuel vapors if those vapors are heated to explosive levels. The air conditioning units are located under the center fuel tank on Boeing-made planes, and the heat given off during ground operations can be get into the tank, raising the temperature of fuel vapors. A flight attendant was killed and several other people were injured by the blast on the Thai jet, which was first thought to have been a bomb planted to kill the Thai prime minister. He and his son were waiting to board the jet with the other passengers. Boeing last night sent a telex to all 737 operators recommending the fuel boost pumps in the center fuel tank not be used when the tank is empty. The FAA's airworthiness directive is expected to mirror the Boeing telex but make the recommendation mandatory, the industry source said. The boost pumps are used to transfer fuel from one tank to another. It is not known what role, if any, the pumps played in the explosion on the Thai jet. What is known from the board's statement yesterday is that fuel vapors in the tank would have been heated by running the air conditioning units for so long while the jet was on the ground. All of Boeing's planes except the 717, formerly the McDonnell Douglas MD-95, have the air conditioning directly below the center wing tank. McDonnell Douglas jets have air conditioning units in the front or rear of the plane. Airbus jets have air conditioning packs under the center wing tank, but the design incorporates a cooling system. The safety board last year criticized the design of Boeing jets because of the placement of the air conditioning units and the lack of a ventilation cooling system. The criticism came as the board ruled that fuel vapors in the center wing tank of TWA Flight 800 had been heated to explosive levels because the air conditioning units on the 747 had run for more than two hours while the 747 was parked on the ground. The tank exploded about 13 minutes after the jet took off from Kennedy airport on a flight to Paris July 17, 1996, killing all 230 aboard. The board said a spark of unknown origin in the tank apparently ignited the vapors. Had the vapors not been heated, there would have been no explosion, the board said. Until last month's explosion on the Thai jet, the only known 737 center fuel tank explosion was that of a Philippine Airlines jet in 1990 at the Manila airport. The explosion killed eight people. As was the case with the Thai jet, it was a hot day and the air conditioning packs on the Philippine Airlines jet had been running for some time when the fuel tank blew up as the plane was being pushed back from the gate. Last May, Boeing recommended in a service letter to operators of its jets that air conditioning units not be turned on when a plane is on the ground if the outside air temperature is higher than 60 degrees. 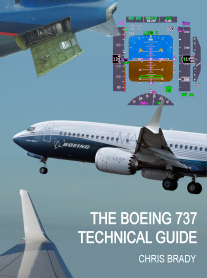 The FAA subsequently issued an informational bulletin to FAA representatives assigned to each air carrier encouraging the application of Boeing's recommendations. But the FAA did not issue a rule that would make Boeing's recommendation mandatory. That could change as a result of the Thai explosion, according to people familiar with the matter. The Seattle Post-Intelligencer reported two weeks ago that the investigation of the Thai Airways incident was focusing on a center fuel tank explosion and not a bomb. In its statement yesterday, the safety board said the accident occurred at 2:48 p.m. on a day with temperatures the high 90s. The initial explosion of the center tank was followed 18 minutes later by an explosion in the right wing tank, the board said. "Air conditioning packs, which are located directly beneath the center wing tank and generate heat when they are running, had been running continuously since the airplane's previous flight, including about 40 minutes on the ground," the board said. The safety board last year strongly recommended that inert nitrogen gas be pumped into jetliner fuel tanks to lessen the danger of an explosion. That recommendation is still under study by the FAA. The FAA has said that computer modeling shows that a flammable fuel and air mixture exists in the center fuel tank of commercial jetliners about 30 percent of the time. That would only be reduced to about 25 percent by not running air conditioning units when a plane is on the ground, according to the FAA. But pumping inert nitrogen into tanks would dramatically reduce the time a dangerous fuel mix is present to about 2 percent, the FAA has said. The FAA is studying a ground-based system that would pump inert nitrogen into the center fuel tank before takeoff. The cost of that system would be about $1.6 billion over 13 years and would take three years to implement on all U.S. jetliners. The agency is awaiting a final report by an aviation rule-making advisory committee before deciding how to proceed. That report is expected by July. SUMMARY: This amendment adopts a new airworthiness directive (AD) that is applicable to all Boeing Model 737 series airplanes. This action requires revising the Airplane Flight Manual to prohibit extended dry operation of the center tank fuel pumps (with no fuel passing through the pumps). This action is necessary to prevent ignition of fuel vapors due to the generation of sparks and a potential ignition source inside the center tank caused by metal-to-metal contact during dry fuel pump operation, which could result in a fire or explosion of the fuel tank. This action is intended to address the identified unsafe condition. SUPPLEMENTARY INFORMATION: On March 3, 2001, a Boeing Model 737-400 series airplane caught fire and burned while parked at a bay at the Don Muang International Airport, Bangkok, Thailand. Although the accident investigation is ongoing and the probable cause of the accident has not been identified, the Government of Thailand, in conjunction with the National Transportation Safety Board, has determined that the center tank exploded shortly after the main fuel tanks of the airplane were refueled. It appears that the center tank fuel pumps were operating dry (no fuel was passing through the pumps) at the time of the explosion. This accident is similar to the 1990 center tank explosion that occurred on a Boeing Model 737-300 series airplane. The ignition source of that explosion was never identified. The center tank fuel pumps were operating dry at the time of that explosion. Extended dry operation of the center tank fuel pumps, which had occurred prior to both incidents, is contrary to the manufacturer’s procedures for safe operation of the fuel pumps. Extended dry pump operation can result in overheating and excessive wear of the pump bearings and consequent contact between rotating and nonrotating parts of the pumps. Both overheating of the bearings and contact between rotating and nonrotating parts have the potential to create an ignition source in the form of hot surfaces or sparks. In addition, during dry operation of the pumps, ignition of vapor in a fuel pump can create a flame front that can reach the fuel tank and cause a fuel tank explosion. In light of this information, the FAA finds that certain procedures should be included in the FAA-approved Airplane Flight Manual (AFM) for Model 737 series airplanes to prohibit dry operation of center tank fuel pumps. The FAA has determined that such procedures currently are not defined adequately in the AFM for these airplanes. Since an unsafe condition has been identified that is likely to exist or develop on other airplanes of the same type design, this AD is being issued to prevent ignition of fuel vapors due to the generation of sparks and a potential ignition source inside the center tank caused by metal-to-metal contact during dry fuel pump operation, which could result in a fire or explosion of the fuel tank. This AD requires revising the AFM to prohibit extended dry operation of the center tank fuel pumps. 2001-08-24 BOEING: Amendment 39-12201. Docket 2001-NM-94-AD. Applicability: All Model 737 series airplanes, certificated in any category. (a) Within 7 days after the effective date of this AD, revise the Limitations Section of the FAA-approved AFM to include the following information. This may be accomplished by inserting a copy of this AD into the AFM. "For ground operation, center tank fuel pump switches must not be positioned to "ON" unless the center tank fuel quantity exceeds 1,000 pounds (453 kilograms), except when defueling or transferring fuel. Center tank fuel pump switches must be positioned to "OFF" when both center tank fuel pump low pressure lights illuminate. Center tank fuel pumps must not be "ON" unless personnel are available in the flight deck to monitor low pressure lights." (d) This amendment becomes effective on May 10, 2001. Consumer and safety advocates Wednesday attacked an aviation industry report about fuel tank safety as biased and unfair. The report concluded that injecting non-flammable gas in jet fuel tanks to prevent explosions is too expensive. In a contentious meeting, the Federal Aviation Administration's advisory panel on the feasibility of requiring inert gas in fuel tanks voted to receive the report. Inert gases are non-flammable gases that prevent fuel vapors from exploding. The panel gave itself 90 days to decide whether the report needs to be changed. The FAA and The Boeing Company recently conducted the first Ground-Based Inerting Tests (GBI) in the fuel tank of an operational aircraft, providing additional data to support the FAA’s continued development of new regulations to significantly reduce the amount of time flammable fuel-air vapors can be contained in transport airplane fuel tanks. “Eliminating or significantly reducing exposure to flammable vapors—together with the recently issued Special FAR 88 that requires a review of large transport airplane designs to eliminate fuel tank ignition sources—is part of the FAA’s two-pronged approach for preventing transport airplane fuel tank explosions,” said Bill Cavage, project manager of Fuel Tank Safety R&D with the Office of Aviation Research Fire Safety Section (AAR-422). A series of five ground and five flight tests were performed on a Boeing 737-700 to measure oxygen concentration at eight locations in the fuel tank and to provide signals to the aircraft’s onboard data acquisition system. High fuel load tests quickly became non-inert, since the consumption of fuel induces airflow into the tank through a vent, increasing the oxygen concentration to near atmospheric oxygen levels. However, most flights have no fuel loaded in the center wing tank and therefore GBI can provide a significant reduction in overall fleet flammability exposure. Testing has also determined that vented fuel tanks will remain inert for the remainder of ground operations, taxi, and a significant portion of flight operations—depending on temperature changes, ground duration, and fuel load. The inert gas could be provided by a ground source or from aircraft equipment, designed to run during ground operations. 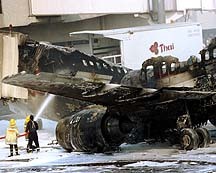 Since the crash of TWA 800 in 1996, emphasis has been placed on fuel tank safety and fuel tank inerting has been studied as a method for reducing the exposure of flammable fuel-air vapors in commercial transport fuel tanks. Previous FAA regulations were based on the assumption that the fuel tank was flammable and only design modifications to the tank were required. Research has shown, however, that fuel tank inerting reduces the concentration of oxygen to a level that will eliminate the risk of combustion by using nitrogen gas to displace air in a fuel tank vapor space. A working group was recently formed by the FAA Aviation Rulemaking Advisory Committee to evaluate a potential rule change that would require a significant reduction in commercial transport airplane fuel tank flammability exposure with an emphasis on center wing and body style tanks. To further validate existing commercial transport fuel tank inerting data, AAR-422 has begun GBI ground testing on a Boeing 747 SP. Plans to test an onboard inerting system are scheduled for next spring on the same ground test article to gauge the practicality of using onboard systems for fuel tank protection in the commercial transport fleet.